What do Expats miss most about a British Christmas? Over the festive period we have had a huge number of Christmas themed British Gift Boxes literally flying off the shelves to be delivered all around the world in time for the big day! Although embracing new and exciting cultures and festive traditions from all corners of the globe can be incredibly exciting, it’s hard to stop missing some homely comforts that remind you of past Christmases at home. We’ve been asking around about what British expats miss most, so here are a couple of British things that expats can’t seem to live without in the festive period! An old-time favourite in Britain, Terry’s Chocolate Orange has been around for years and is expected at the bottom of every Christmas stocking! 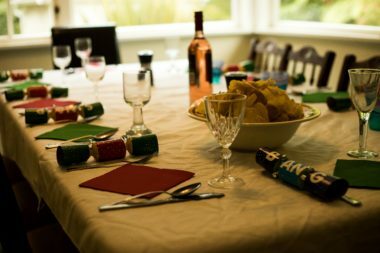 It’s simply not Christmas without Christmas crackers, but you’ll be surprised to find out crackers aren’t a big thing in many places around the world! Try explaining what a Christmas cracker is to someone who has never heard of one – it gets interesting! Let’s face it, no other brand is the same. It’s not something that immediately comes to mind, but having copious amounts of gravy on your Christmas dinner is essential! When you think you’ve eaten your weight in turkey, chocolate and mince pies, there always seems to be just that bit more room for Twiglets! These minty delights can’t be forgotten! Have you ever played the After Eight party game? Look on the internet and make sure you play it this Christmas.